Ronald Guth, an author, researcher, educator, collector, and "all-around good guy," is this year’s recipient of the ANA’s Numismatist of the Year award. Guth has authored many books furthering the hobby, including Auction Prices Realized for Certified German Coins, 2nd Edition (2013), Auction Prices Realized for PCGS-graded German Coins, 2nd Edition (2011), 100 Greatest U.S. Coins, 3rd Edition (with Jeff Garrett, 2008), Coin Collecting for Dummies, 2nd Edition (with Neil S. Berman, 2008), and Encyclopedia of U.S. Gold Coins 1795-1933, 2nd Edition (with Garrett, 2008). "I’m currently working on a book with broad market appeal, but the title and contents are secret for now," Guth hinted. Guth started collecting coins in 1964 and is the President of PCGS CoinFacts™ (www.PCGSCoinFacts.com), an extensive online resource for collectors that includes pages for 33,483 coins with more than 5,171 individual coin narratives. "There is no one more deserving of this recognition than Ron. His contributions to the hobby and profession are far-reaching and wide-ranging," stated David Hall, President of Collectors Universe, Inc. (NASDAQ: CLCT), the parent company of PCGS CoinFacts. "He shares his knowledge and numismatic goodwill through books, educational seminars, and of course, through the tremendous expansion of PCGS CoinFacts under his leadership the past six years." 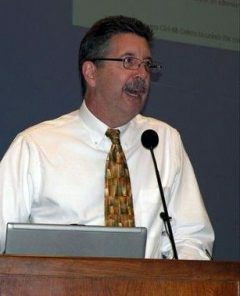 Guth has received a number of literary awards, including Best U.S. Coin Book, 2006; Best Investment Book, 2003; Book of the Year, 2003; Best All-Around Portfolio, 2003; Extraordinary Merit, 2002; and Best Software, 2001. He has also received the ANA’s Presidential Award (2006), Glenn Smedley Award (2006), Olga & Wayte Raymond Award (1982) and Heath Literary Award (1982). "Numismatics is a school where one can learn about people, history, geography, economics, politics and related subjects simply by studying the coins themselves," an ANA news release quoted Guth. "I am particularly fascinated by this educational component of coin collecting because it brings these subjects to life." Guth will receive the Numismatist of the Year award at the 2014 Chicago ANA World’s Fair of Money (www.worldsfairofmoney.com) banquet on Friday, Aug. 8.